The Android versus iOS debate is as controversial as Pepsi versus Coke. But like the two colas, Android and iOS today are more alike than they are different. So if one has to choose between the two platforms, there isn’t much to lose — you can do most smartphone tasks on either platform. But now that we know what Android O 7 New Android O Features You Can Get Right Now 7 New Android O Features You Can Get Right Now The Android O Developer Preview is out for select devices! But you can get the best features on your phone or tablet without upgrading. Read More and iOS 11 What's New in iOS 11? The New Features Coming to Your iPhone What's New in iOS 11? The New Features Coming to Your iPhone Here's everything coming to your iPhone and iPad with the arrival of iOS 11 later in 2017. Read More both offer, it turns out that there are still some things you can do on an Android phone that you just can’t on an iPhone. And although there are many other tiny advantages, we’re going to point out the five big ones. If you Googled “iOS 11 Wish List,” you’d see that almost every publication asked for the ability to switch default apps. But alas, instead of Apple losing its iron grip over its platform, it prefers to update the features of existing default apps to keep them relevant. For example, iMessage got a huge update in iOS 10 with stickers, and with iOS 11 came person-to-person payments — while Apple Maps this year got indoor details and Safari got privacy-focused improvements. But even in iOS 11, clicking a hyperlink or a shared location on WhatsApp will open Safari and Apple Maps respectively, and not your favorite third-party service. But in Android, you get the option to choose an app to perform a specific action. For instance, do you want to open addresses in Waze instead of Google Maps Waze vs. Google Maps: Which App Will Navigate Home Faster Waze vs. Google Maps: Which App Will Navigate Home Faster Waze and Google Maps are both solid navigation apps, but which one is the best? Read More ? Or do you want to open links in Opera instead of Chrome? You can do that. We’ve got detailed info on how it’s done right here How to Master Default Apps and Deep Linking on Android How to Master Default Apps and Deep Linking on Android A big advantage of Android is the ability to set default apps, which allows you to seamlessly use third-party apps for email, SMS, web browsing, etc. Read More . This was yet another feature that was untouched in iOS 11, despite a lot of people asking for improvements. The Notification Center on iPhones still spawns individual entries for every notification, resulting in a cluttered view. Compared to this, in Android 7.0 Nougat, multiple notifications from the same app are neatly tucked inside one single header that expands with a simple flick down gesture. Next, there’s no one-step way to dismiss an iOS notification that doesn’t require any action. It’s a two-step process: swipe right-to-left, then tap the clear button. Whereas in Android, a simple long swipe over a notification dismisses it. This is a rather underappreciated convenience — just think about the number of notifications you end up clearing every day. Android’s notification design also makes better use of the space. If you have multiple Gmail accounts configured, you can see which account you received an email from up top. Other apps like Slack also use this space to indicate the team you’ve received a notification from. On top of all that, Android has something called Priority Notifications. If an app is marked as “priority,” then its notifications will get through even with the Do-Not-Disturb mode turned on. Android O also takes notifications to the next level with the ability to snooze them. Plus, Android O introduced Notification Channels, which will give users granular control over the kind of notifications they want to receive from an app (provided developers are willing to offer such controls). This feature has long been available on Android phones, and there’s been no easy way to do the same on an iPhone. There are legal implications of recording a phone call Is It Legal to Record Phone Calls? Is It Legal to Record Phone Calls? Planning on recording phone calls? It's relatively easy, but is it legal? It's best to check your local laws for specific regulations, as they can differ from state to state, country to country. Read More , which is a bit sad because there are times when recording a call can come in quite handy. For instance, when you’re conducting a telephone interview and want to keep a recording handy for transcription later. 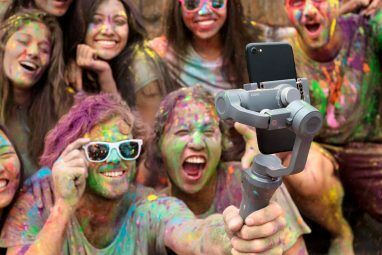 Every Android phone supports third-party call recording apps How to Automatically Record Calls on Android and Never Run out of Space How to Automatically Record Calls on Android and Never Run out of Space Recording phone calls is a great way to keep data for your records. Let's compare some apps that will do this on your Android phone. Read More , and some Android phones, like ones made by Xiaomi, have the call recording feature built into the dialer app. 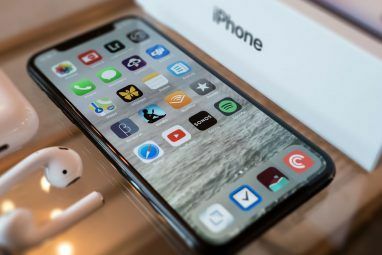 Although there are call recording apps on the iOS App Store, many of them require a three-way call conferencing facility enabled, or use some kind of VOIP-based call-back system. And you have to pay for each recording. The bottom line is: recording phone calls on an iPhone simply isn’t as convenient as it is on Android. Multi-user mode is yet another feature that Apple chose to ignore not just on the iPhone, but even the iPad, which has a higher chance of being shared by multiple people in a household 4 Tips for Sharing a Tablet with Multiple People 4 Tips for Sharing a Tablet with Multiple People So you're looking to share one tablet between your family or roommates -- here's how to make that a much easier process. Read More . Ever since Android 5.0 Lollipop, Google has built multi-user mode into the code. 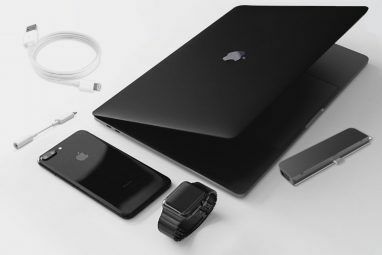 This means, like a Windows or Mac computer, you can switch from one account to another, with each account’s data guarded by pin, passcode, or fingerprint. For temporary use, there’s also a guest mode. To access this multi-user mode, you have to pull the notification shade down twice and click the profile icon. Unfortunately, there’s a good chance you may not find this icon on your Android phone, even if it’s running 5.0 and above. That’s because some manufacturers have removed a full-fledged multi-user mode and replaced it with their own solution (in Samsung phones, it’s called Private Folder). And these replacement features often aren’t as seamless as Google’s implementation. Side Note: If your Android phone doesn’t have a proper multi-user mode, you can use App Pinning, which like Guided Access on iOS, only runs the pinned app until you unlock the phone. iPad apps gained the ability to run side-by-side since iOS 9. And in iOS 11 for the iPad, you can not only run apps in a split-screen view, but you can even have floating windows of apps to drag around. Alas, iPhone users don’t get this feature. Samsung’s Android phones have had the ability to run two apps simultaneously since 2012’s Galaxy Note 2. And last year with Android 7.0 Nougat, Google has officially baked in split-screen multitasking 7 Reasons You'll Want to Upgrade to Android Nougat 7 Reasons You'll Want to Upgrade to Android Nougat If you're thinking about making the jump to Android 7.0 Nougat, maybe these features could convince you. Read More to the software. There are plenty of benefits to running two apps at the same time. Say you’re watching an event live on YouTube and want to keep a constant eye on your Twitter stream — phone screens may have once been too small for multiple apps, but they’re certainly big enough now. Don’t let this post fool you into thinking that the iPhone is still the rigid mobile operating system it once was. For example, in iOS 11, Apple finally introduced a File Manager app, something that it hadn’t done despite years of people asking for it. Also in iOS 11, the Control Center has become highly customizable, Siri can now do translations, and screen recording and screenshot annotation features are built-in (stock Android doesn’t even have that). Next year, we hope Apple knocks off a few of the above limitations. What do you think? 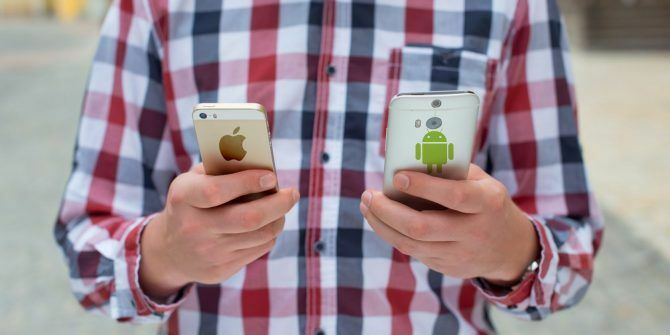 Are these reasons enough for you to switch from an iPhone to Android? Let your thoughts flow in the comments section. Explore more about: Android, iPhone. I don’t have an iPhone, but I do have a PC and an Ipad and I easily copy photos between them, using the cloud, in my case Onedrive. Should work the same way for your iphone. Up till now still for free. If you use the cloud only for copying purposes and then remove it from the cloud, you can keep on using Onedrive or something else for free for ever. I never use Itunes anymore. Well now. Since I hardly use my iPhone 4s These little irritants don't bother me one iota! My iPad Pro is used for everything. I've even abandoned my laptop and and Apple desk top computer. Haven't sent an email or received one in around six months on the iPhone. iPad for me!!!!???? Another features is FM Radio. Many Android phones have the FM Radio Chip activated allowing you to listen to FM Radio like you would in your car. This is not streaming, so it doesn't require internet access and doesn't use data.